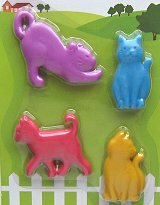 The manufacturer calls these cat magnets a wild bunch of cats. There are 4 brightly colored plastic cats in each package. The purple cat is 1 3/4" wide x 1 1/2" high - to give you an idea of the size of the cats.